—Photo by LCpl Aneshea Yee. Family and friends of Marine Corps Recruits are strongly encouraged to attend the graduation ceremonies for the announcement that your Recruit has earned the respected title of United States Marine. Graduation is two-part: Thursday is "Family Day" and Graduation is Friday. The Marine Corps will have activities planned for both days. 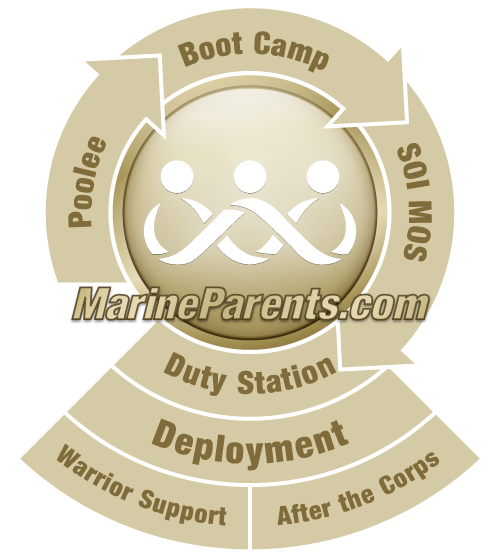 "Family Day" includes two events in your Recruit's final training days. The first is the "Motivational Run", the final run for the company of recruits. Your Recruit will also be allowed "Liberty", a time to visit with family and friends, have lunch together, and tour the non-restricted areas of the Depot. Graduation will take place on Friday and is the culmination of Recruit Training. There are occasions when graduation will not be held on Friday due to holidays. These likely include Thanksgiving, Christmas and Easter. In this case, family day will be on Tuesday and graduation on Wednesday.